Hallmark Movies & Mysteries "Marrying Father Christmas"
This post is brought to you by Hallmark Movies & Mysteries. All opinions are my own. Do you know what the most wonderful time of the year is? Hallmark holiday original movies season! It’s become a tradition for my husband and I to watch all the new holiday original movies from Hallmark as soon as they air— this year we can look forward to 37 new original movies between Hallmark Channel and Hallmark Movies & Mysteries! The first original movie on our agenda is Marrying Father Christmas, which premieres this Sunday, November 4 on Hallmark Movies & Mysteries. 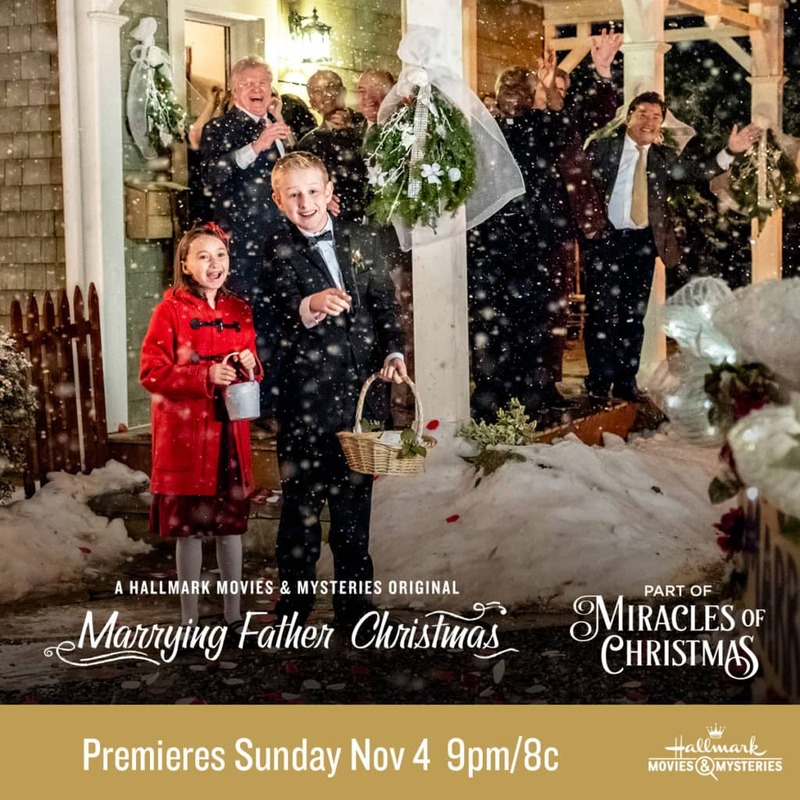 If you’re not familiar, Hallmark Movies & Mysteries is a separate channel that features all the best Hallmark original movies and mysteries…if you’re a fan of original holiday programming, then you’ll definitely want to get on board the Hallmark Movies & Mysteries #MiraclesofChristmas lineup with 15 all-new movie premieres! Want to get even more into the holiday spirit? Here’s more holiday fun! Tune in to Hallmark Channel Radio on Sirius XM Channel #70 to listen to timeless Christmas music and carols + be eligible to win one of 35 sets of ornaments and a Balsam hill tree! 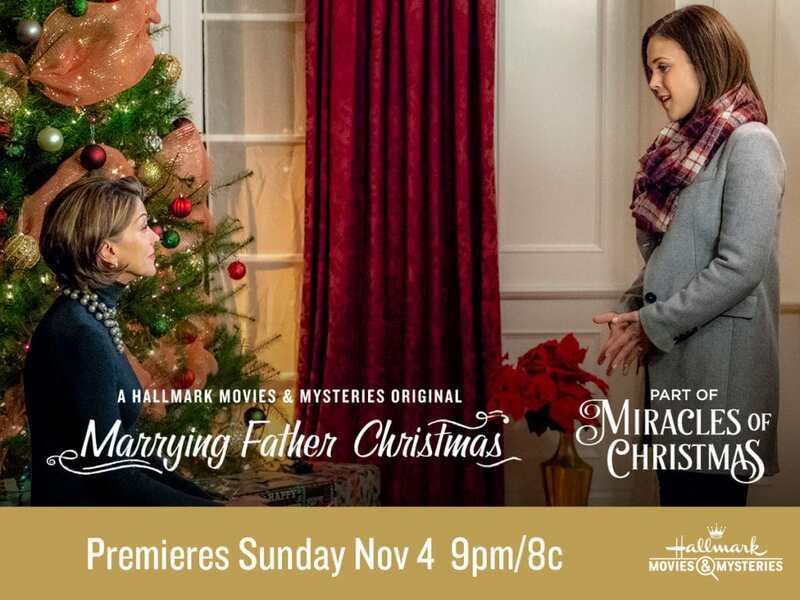 Be Sure to Watch “Marrying Father Christmas” on Hallmark Movies & Mysteries on 11/4 at 9pm/8c and Tweet along with hashtag #MarryingFatherChristmas! I love spending the family time w/ my kids. The Holidays are important to me because it’s a way to connect to the past and build traditions with the kids now! Besides, everyone is nicer to each other! I love Lifetime movies so I definitely look forward to this one too! I love the Hallmark Movies and am looking forward to seeing this one. To me, Christmas means family and spending time with the ones we love. Spending time with family makes my holidays. I would like to see the movie. The holidays are very special to me and I am thankful for all of are service men and women who sacrifice so much. A time to look at decorations and prepared big meals. Hoping to find some happiness in all this. The holidays are important to me because it is time to spend with family. I am excited b the movie Marrying Father Christmas because it looks like a great family film. Holidays always means quality and fun time with family to me. I am excited to see ‘Marrying Father Christmas’. Definitely looking forward to this movie and all of the Hallmark movies. The holidays means more tme to spend with the grandchiildren and other family members. Also, friends come this way to join in the holiday fun! I love when the whole family gets together for Christmas festivities. spending time with my family.yes cant wait to watch this movie. I love having all my kids and grandkids home to spoil. I look forward to watching this and all the other new Hallmark Christmas movies! Holidays mean spending time with family to me. Yes, I’m very excited. The holidays are a time for the whole family to get together and celebrate thew reason for the season. I’m excited about seeing this great movie. I enjoy being with my family during the holidays. I just love the whole season…the snow, the feeling of peace…It’s beautiful. I started watching the Hallmark Christmas movies the day they began. Looking forward to all the new movies. I love the holidays. A time of family and love celebrating Jesus birthday. T me, holidays are times to get to get together with the family to share food, good times and make memories. Holidays mean family, and yes, look forward to watching the movie. The holidays mean spending quality time with my husband and kids. I’m excited about having a Hallmark holiday movie that’s clean to watch with my daughters. I am very excited about the movie. The holidays mean family to me, just spending time together. I love the Holidays. Such a great time of the year. We really get into the lights, the Christmas movies, and making stuff for people. The Hallmark movie looks good, I would watch it. Christmas is family and gathering. It means laughter and then also remembering our special loved ones who are not able to join us. As for the Hallmark movie I have seen the two previous ones and look forward to seeing this new one. The holidays are always about spending time with family. I would like to check out the movie too! The holidays are a time to try to slow down and be grateful for the good things. I think this movie sounds cute, funny and romantic. The Holidays mean celebrating Christ’s birth and family. I am very excited for this movie. The holidays mean spending time with my family. Yes, I am excited about this movie. The holidays are time to spend time with my family and friends. Christmas means celebrating Christ’s birth. I love spending time with family. I am looking forward to watching Marrying Father Christmas. I cannot wait to see this. They Holidays are so exci For me. All my family and friends spend precious time together. I love Hallmark movies and am excited about this one. 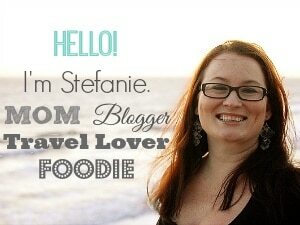 The holidays mean lots of cheer and good food to me. The holidays mean seeing a smile on every face. I plan on watching Marrying Father Christmas. I love Hallmark movies. Holidays are all about family and lending a helping hand to others. I love the holidays, it the one time of the year when the family comes together. Love the holidays and spending time with family. I am excited to see this movie. We like to come together during the holidays. It is nice spending time with family, watching movies, and relaxing. I look forward to all the new movies on Hallmark this holiday season. Christmas means an entire season of fun family filled quality time. Seeing distant family and making new memories! I’m looking forward to all the New and Old Christmas movies from Hallmark! The Holidays means good times with family and friends. Yes, I am excited for the movie! For me the holidays are a time to be with family and friends and to honor the birth of Jesus Christ. I am very excited to watch this on Hallmark! The holiday are about being grateful for the things you have instead of the things you want. I love watching HallMark movies during the holiday season! I am so excited for Marrying Father Christmas! Will be tuning in tonight. The holidays are about relaxing and having fun with family. The holidays mean special time spent with family and friends. This looks like a good movie. I love spending time with my family for the holidays and eating good food! My favorite part is Celebrating that it is Jesus’ Birthday by going to Holy Mass (as we do every week)! Wheee! Thanks and God bless! The holidays mean spending time with my family. I can’t wait to see this! Family friends and food. Lovecthat everyone is nicer during the holidays😲 the movie looks light, fun. The Holidays means spending more time with my kids and grandkids!!! An yes I cant wait to watch Marrying Father Christmas!! The holidays means getting together with out of state and in state family. I look forward to seeing the movie. The holidays mean spending time with family and friends. Yes, I’m excited to watch Marrying Father Christmas and all of the other Hallmark Christmas movies. I love the Hallmark Holiday movies. They make life merrier. The holidays are about spending time with family and off work. It’s also about baking and sharing yummy treats! The Holidays mean family and friends get togethers to enjoy the season of Christmas. I can’t wait for Marrying Father Christmas tomorrow. I love Hallmark Christmas movies always touching and heartwarming. Hallmark movies make me feel warm and fuzzy. I love seeing my family, too! Holidays mean LOVE to me. Holidays mean time with family. I’d love to see this movie! I love Christmas Eve with the family and can’t wait till the next Father Christmas! This is a great time to be with family. It is the time of year we make time to meet up with loved ones and spend time together. Holidays mean time with family and good memories to me! To me the holidays mean quality time with my family. I love spending the whole day with them cooking, eating, and playing games. I love Hallmark movies! They make me feel comfy and happy! Love good Christian movies and any Hallmark makes. THE HOLIDAYS MEAN SPENDING QUALITY TIME W/MY KIDS. I AM EXCITED ABOUT ALL HALLMARK CHRISTMAS MOVIES !! The holidays are a time for family to spend time together. I do love a good holiday christmas movie. There is something so comforting about it. The main part of the holiday season is time spent with loved ones whether its decorating our home and tree together or sharing a delicious meal or making special cookies with my nieces. The movie looks great! To me the holidays are all about family, giving and the birth of Jesus! The holidays mean that even with all the hype and exhaustion, almost everything actually revolves around love–of God, family, mankind. Holidays mean spending time with family and friends, especially those who live so far away. I love watching all holiday movies. For me the holidays means taking a break from work and focusing on family time. I love holidays. Holidays mean cherished moments and quality time with my family. I am really looking forward to seeing the Marrying Father Christmas movie! The holidays mean spending time with family. I can’t wait to see this! The holidays mean good food, good movies, beautiful decorations, Christmas music and spending time with family. Yes, I’m looking forward to seeing this! The holidays mean getting together with family. The meals, the decorations, and the gifts are all wonderful. It is a time when our family reconnects. As for the movie, I haven’t seen it, but I would really like to. I love the holidays and can’t wait to see the movie. Spending time with my family. Christmas is sometimes hard because my Mom died two years ago at this time. I love spending time with my family for the holidays. I am looking forward to watching Marrying Father Christmas. I enjoy spending time with family over the holidays. I love watching Hallmark movies and I am excited to watch this one! The holidays mean spending time with family by making new memories and also remembering our past holiday memories. And we love watching the Hallmark Christmas movies! This movie looks great! The holidays mean God’s ultimate gift to us, good will toward man, and spending time with family and friends. I am excited not only about the movie but all of the other Christmas movies. The Holidays mean spending time with my family and friends! I am excited for Marrying Father Christmas!! i love all the holidays, can’t wait to see this movie. It means more kindness in the world; I would like to see this movie. I love the holidays. I love watching Christmas movies and drinking hot cocoa, bonus if it is snowing! The holidays mean to me Family, Food and Fun!! The Holidays means spending time with family, good food and people seem to be more caring and considerate this time of year even if its just for a short time. The movie looks cute and I look forward to watching with family. The holidays mean being grateful for the things you have already instead of the things you want. The holidays to me is a time to reconnect with everyone through spending time together. Yes, I do want to see this movie. The holidays are for spending time with family and friends. The movie looks intriguing. Xmas to me means regaining former friendships. I look forward to seeing that movie because I am a fan of Xmas shows. The holidays mean spending time with family and close friends to include those individuals who you only see once a year during the holidays. I love watching Hallmark movies and am excited to see ‘Marrying Father Christmas’. The holidays mean a lot to me because I get to spend time with family and friends that visit from out of town. Can’t wait for the movie! It means together with family. Holidays mean watching goofy movies like this with my dad! I love spending time with my family and friends- and all of the food of course! The holidays mean I get to spend time with my children and grandchildren all together which doesn’t happen often these days. I do look forward to seeing the movie. SPending time with family and I am excited about the movie I love Hallmark Christmas movies. Holidays mean spending time with my kids and family. this is the first I have heard of that movie. I like getting together with my whole family on the Holiday season, having a nice baked ham and serve up some gifts. I cannot wait to see this movie. I love the holidays. It’s nice spending time with my family and watching Christmas movies. The holidays for me are all about time with family and loved ones. I can’t wait to see this movie. The holidays are a special time to spend with my family and make new memories! The holidays are all about family with me. I get to spend some extra time with my sons, husband and extended family. My boys and I bake cookies together and we all watch holiday movies each night together. The holidays always bring us a little closer together. I am always looking forward to Hallmark holiday movies. please check your email box ,looking forward to your early reply ! THe holidays mean alot.Folks forget the true meaning of Christmas.Yes I am excited for the holiday movies! Holidays ate the best family time. I love Hallmark movies especially the holiday ones. Holidays are the best family time. I love Hallmark movies especially the holiday ones. I’ve always enjoyed Hallmark movies and this looks like a really nice one to see. The holidays are about spending time with those you care about. I’d like to see the movie with my family. For me the holidays is a time for renewal. Renewal of my faith, renewal of my relationships with family and friends and renewal of my spirit while eating seasonal foods. I’m always excited to relax and watch a Hallmark movie! The holidays mean cherishing past memories while making new memories. A lot of my family members, including my mom, are gone, but I still love having get togethers with family and friends. Sharing the traditions with my daughter. I cannot wait to see the movie. I recorded it as we were out. I am so excited for the holidays! I love celebrating with my whole family. The holidays mean so much to me spending time with those we love eating great foods we have made.I can wait to see the movie ‘Marrying Father Christmas’ will watch it with our family. I’m excited to see my family for the holidaysIt means celebrating Jesus’s birth, giving gifts and food and games. The Holidays mean getting to see all of my family on both sides! Yes! I Love all Hallmark Movies! I love the holidays because they mean spending time with my family. The movie sounds interesting. My family is spread out, so it’s a great time to see them all together at once. Very happy to see the movie. It means faith, family,food and love. For the past 12 years the holidays meant financial stress and stress from in-laws I’m hoping this year it’s a lot more relaxing with just my spouse and children.